Didn’t finish off that tube of loop sealant? Use the Sealant Saver to extend the life of your left over BD Loop Goop! Loop Sealant is expensive, and nothing is more frustrating than having to throw out perfectly good loop sealant because you didn’t use the full tube. This is why we created the Sealant Saver and started including it for free with cases of BD Loop Goop. The Sealant Saver is made with durable PVC and is threaded to make screwing it onto tubes of BD Loop Goop easy. This handy Sealant Saver makes an air and water tight seal on your tube of BD Loop Goop and dramatically extends its usable life. 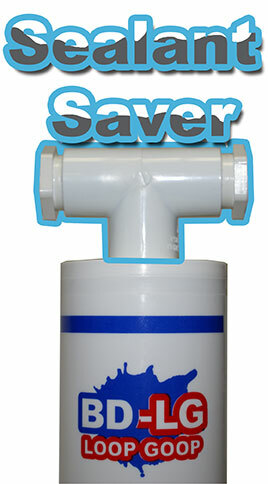 The “T” shape design of the Sealant Saver makes it easy to grip and twist. Simply twist it onto your open tube of loop sealant to save the remaining loop sealant. The Sealant Saver only works with BD-LG (Loop Goop). Maximize your savings when installing Saw-Cut Loops by taking advantage of all the time and material saving design features BD Loops’ saw-cut loop system has to offer. Many installers don’t realize how important using the right sealant is for increasing the life of saw-cut loops. Polyurethane sealant has many advantages when compared to other commonly used sealants. • Does not shrink or crack—it does not have an evaporation cure like most other sealants. • Does not conduct electricity—water based sealants can facilitate shorts to ground. • Has a low viscosity (flows easily) is easier on your hand when applying, and is self leveling. • Can be cleaned up with rubbing alcohol. • 30oz Tubes—most rubber and water based products come in 28oz tubes. BD-LG has nearly 7% more sealant. The included 3/16” flat sealant tips allow installers to seal the loop in one pass, from the bottom up. Pointed tip applicators fill the groove from the top down and require multiple passes to seal the groove. Tip is modified to allow even flow, less overflow waste. Sealant tip is removable tip vs. a fixed pointed tip. BD Loop Goop ships with the sealant tips detached, to prevent torn boxes and damaged sealant tubes commonly seen with fixed pointed applicators. Each case of BG-LG comes with a free Sealant Saver! BD Loops is a designer of preformed direct burial and saw-cut inductance loops for the gate, door, and parking industries. With over 14 years in business the quality of BD Loops is unparalleled. BD Loops products are available through over 350 distributors in the U.S. and Canada. BD Loops offers 46 standard preformed loop sizes, all standard and custom loop sizes are ready to be shipped the same day. The company has several letters of recommendation testifying their professionalism and design, and is a member of the following associations: AFA, IDA, NAFCA, NOMMA, IPI, CODA, and IMSA. Visit www.bdloops.com and use the distributor locator to find a distributor near you.